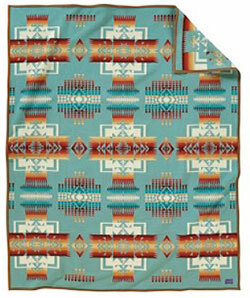 First made in the 1920s, the Chief Joseph blanket is one of the oldest, on-going blankets made by Pendleton Woolen Mills. The blanket pattern celebrates the heroism of the Northwest's great Nez Perce leader, Chief Joseph. Its design is balanced with arrowheads symbolizing bravery and pointing in all directions of Mother Earth. The Chief Joseph is a woven jacquard that is reversible to offer two dramatically different looks. Design is vertical on king blanket. Felt bound. Napped. 82% pure virgin wool/18% cotton. Dry clean. Made in the USA.